Did playing doctor just get real? What if you could diagnose viruses – like Zika – from home? This may be possible very soon! 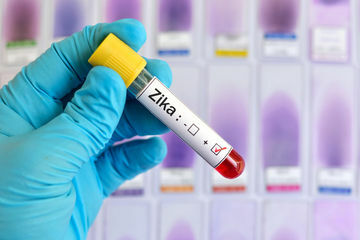 Right now, a Zika diagnosis requires a blood test. This can be challenging and expensive for people who live in remote areas. But Jonathan Gootenberg at M-I-T may have found an easy way! A tool found in bacteria called CRISPR was successful in distinguishing Zika from closely related viruses. It works by detecting single pieces of D-N-A! See, each virus’s D-N-A is a unique set of letters. CRISPR looks through these letters to identify patterns that are ONLY present in Zika. By quickly and carefully going through D-N-A, it can tell even nearly-identical viruses apart! This technology could be simplified to work on test-strips like an at-home blood sugar monitor! The fully-developed version is still a few years away. But, once on the market, it will be a cheap and easy diagnostic tool. So grab your plastic stethoscope and tongue depressors, and you too can be a doctor! Just add lab coat. Just kidding!